Why not spend your North Myrtle Beach, South Carolina vacation in a small, quiet condominium complex that has all the comforts of home? Located just across the street from the beach in the popular Crescent Beach area of North Myrtle Beach, Beach Sandals has everything you need for a relaxing North Myrtle Beach vacation full of lots of time on the beach and days filled with golfing, shopping and dining! Beach Sandals is comprised of four comfortable two-bedroom units, each accommodating a group of two vacationers. 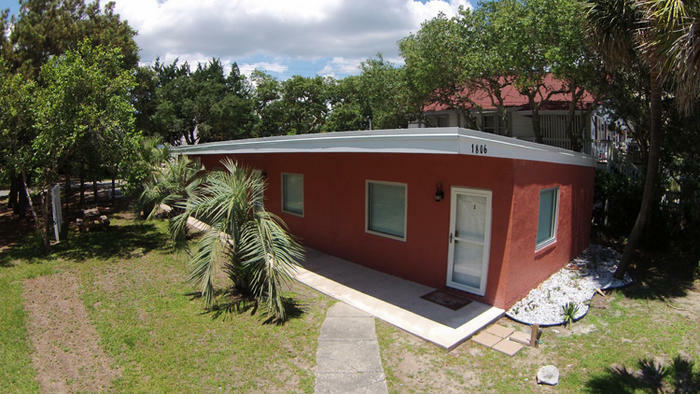 If you are traveling to North Myrtle Beach as a couple, one of these comfortable vacation rentals will be perfect for you. Perhaps you are planning a North Myrtle Beach vacation with your extended family or a group of golfing buddies—why not rent all four of these North Myrtle Beach condominiums and all stay together? Everything you need to be comfortable is contained in these homey vacation rentals. You will enjoy having your own kitchen, where you can whip up a quick breakfast before heading to the beach or dinner after a fun day of golfing at one of the many beautiful North Myrtle Beach golf courses. Beach Sandals provides you with a grill, making it easy to prepare that fresh seafood that you catch at a nearby fishing pier! Wireless Internet access is also provided at this North Myrtle Beach resort so you can keep up with what is going on at home or work while you are on your North Myrtle Beach getaway. If you cannot bear to leave your pet behind when you travel to North Myrtle Beach, Beach Sandals is the place for you—these units are pet friendly with a $300 deposit! Being so close to the beach is another plus when you stay at a Beach Sandals vacation rental. The Atlantic Ocean and its gorgeous beach will provide you and your guests with endless hours of pleasure. Besides riding the waves and sunning yourself on the shore, you might walk a bit on the wild side and do some parasailing, ride horses along the beach zip along the waves on a Sea Doo or take a snorkeling lesson. The ocean is also a playground, offering dolphin-spotting cruises, fishing charters, ocean dinner cruises and more. Of course, all you may want to do is park yourself in a comfy beach chair and wile away the hours in the sunshine catching up on your reading and working on your tan! North Myrtle Beach, South Carolina is a popular vacation mecca and offers many exciting attractions and amusements to keep vacationers busy. It goes without saying that the golf courses in this area of South Carolina are a huge draw, but there is plenty of entertainment for the non-golfer as well. Top-notch live entertainment, from music concerts and comedy clubs, street performers, sporting events and live theatre are prevalent in North Myrtle Beach. There are also more fabulous North Myrtle Beach restaurants, including world-famous all-you-can-eat seafood buffets, than you can possibly experience on one North Myrtle Beach vacation! Shopping in North Myrtle Beach is a popular pastime—visit the outlet malls, unique shops of Broadway at the Beach and Barefoot Landing and the many one-of-a-kind boutiques that line the streets of North Myrtle Beach. You will also find plenty of family-friendly entertainment in North Myrtle Beach. Your kids will love MyrtleWaves Waterpark, Family Kingdom Amusement Park and playing putt-putt on a themed North Myrtle Beach course. Ride go-karts, see a pirate dinner theatre, take a jungle cruise or challenge yourself to bungee-jump—it is all part of the North Myrtle Beach experience!